If you're destined for a beach wedding, you may be interested in beach wedding cakes. Beach weddings are often destination weddings, a popular choice by many couples who are looking to wrap their honeymoon and wedding into one, or to have a smaller, intimate and inexpensive event. To boot, getting married near the shore is extraordinarily romantic, and can make your wedding experience and memories, that much more special. 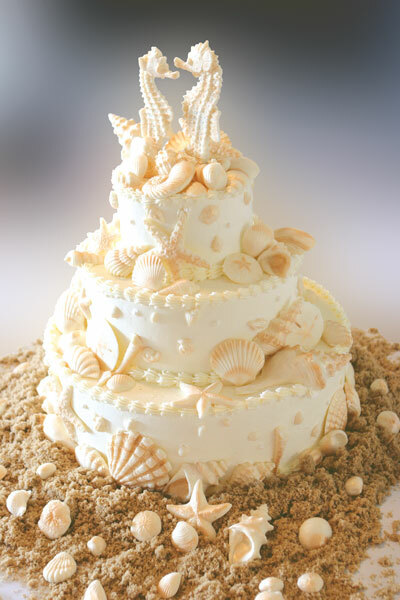 You just can't go wrong with sea shells on a beach wedding cake. So what shells? Beaded periwinkle, Florida cone, and maculated ear moon, are some of the most beautiful sea shells for decoration. Small pieces of coral, is also another great choice. The sea shells can be real (wash them well! ), or can be made from a variety of icing, molding paste or chocolate. Sea shells can be used subtly or as the main design of the cake. A cluster of shells, as the seashell cake topper is a must for this cake design. Crashing waves encircling the cake is the perfect trim for a cake with a surf theme. 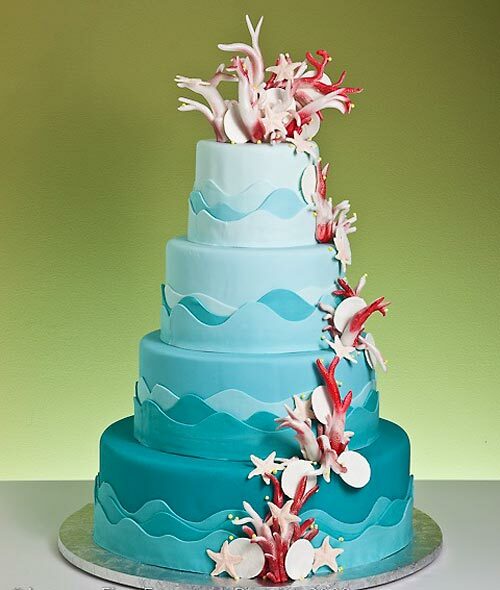 This style cake is most appropriate for couples who surf, or just love the waves. The surf can be puffy foaming waves, or just subtle hints of wave shaped frosting. Incorporating some blue into the cake can help it look more like the ocean. Airbrushing blue onto cake's frosting, gives a real nice blended, and realistic effect. Add in a surf boards or figurines surfing as your cake topper, and you're set. Hibiscus, cymbidiums, tuberose, or any of your tropical favorites. They can be used as a flower cake topper, they can cascade down the side of the cake or tiers, or used sparingly throughout. Tropical flowers can also completely cover the cake, or be used just on the base. Wherever placed, they will dress up the most plain and dull cake - and make it instantly gorgeous looking, and smelling. 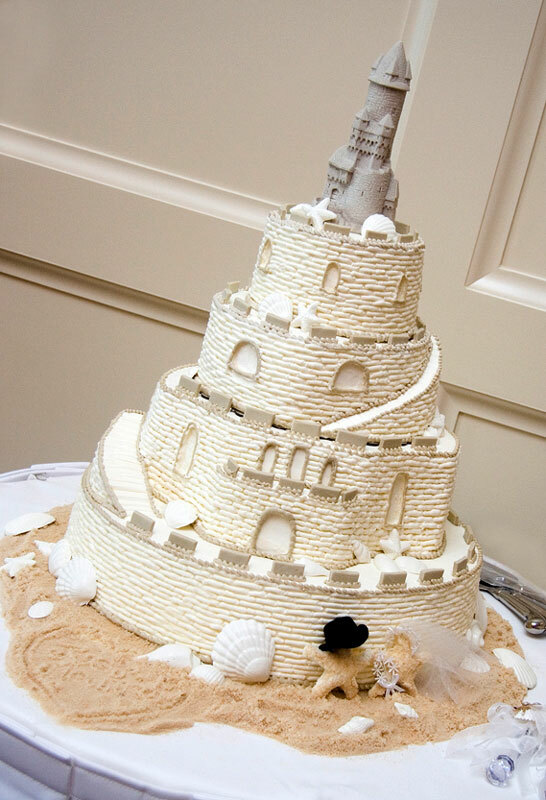 Sandcastles on wedding cakes, are usually used as a toppers. But, we have seen entire cakes shaped like castles, or at least the top half of the cake shaped like a castle, with a few traditional wedding cake tiers below it. To get the sandy effect, the cake can be sprinkled with fine graham cracker crumbs or brown sugar. 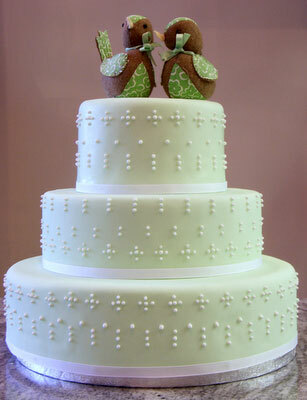 To remind you of your beautiful location, how about a subtle design of palm leaves circling the outside cake? A few coconuts as garnish? A cake topper oasis? How about a cracked open half of a coconut as a cake topper, with bride and groom figurines lounging in it, as if it were a hammock? You don't have to be in the Caribbean to pull this off. 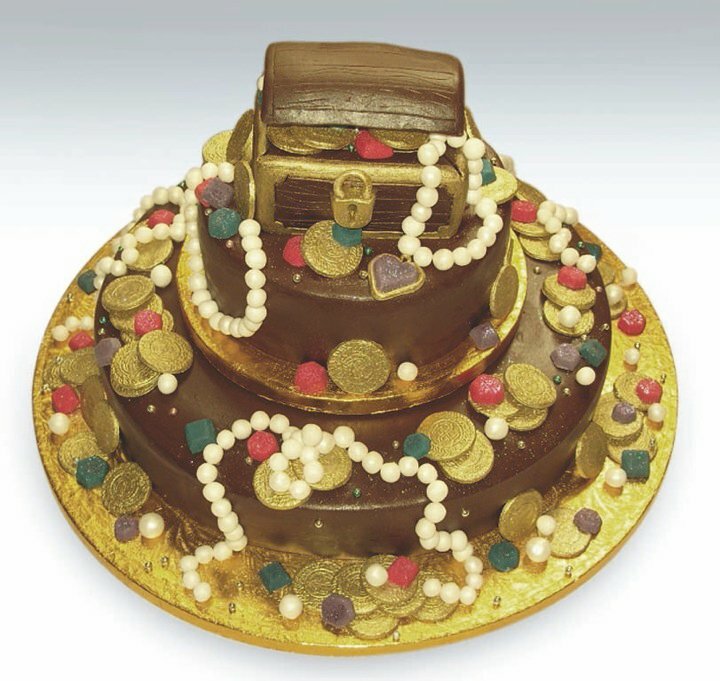 The topper could be a treasure chest with gold coins and jewels pouring out of it, cascading down the side of the cake. If you're in love with Pirates, make have figurine cake toppers of a bride and groom...one as Captain Jack Sparrow, and a fair maiden in her wedding dress, of course. Coat the outside layers of the cake with confections made to look like bamboo. You can also incorporate Tiki masks. We once attended a luau wedding and the cake had miniature tiki torches sticking out of the top, and around the cake on the table. When the bride and groom cut the cake, tribal drums were playing in the background. Love to go snorkeling, fishing, diving, boogie boarding, or kayaking? How about bride and groom figurines fishing for wedding rings off of a pier? This would be easiest to incorporate into a cake topper, but don't forget figurines can be anywhere on the cake! Get creative! Any of your favorite ocean activities can be incorporated into your cake. Sea birds in flight, in love, with their long necks forming a heart. Best as a cake topper, but can be incorporated throughout the cake tastefully if sea birds are your thing. Is your wedding near a really cool lighthouse? We've seen a lot of lighthouse cake toppers, but we also had a client who had her baker create an entire cake as a lighthouse. Another client had the two bottom layers of the cake as tiered rounds, and the top half of the cake was a lighthouse and its surrounding area, right down to the boating docks below it. Not real sand! Many bakers use crushed crumbs, like graham crackers, or brown sugar. The base of the cake can be covered with "sand", or the top of each exposed layer...or the entire cake! Our favorite, is when a pile of "sand" is formed at the base of the cake and spread out on the table a couple inches around it. Something can then be written in the sand, i.e. "Charlie and Beth Forever", or "CV + BE, 9/12/08". You get the picture. Go Nautical! Anchors, ropes, buoys, wooden docks, life preserver rings, etc. These can be made from marzipan, subtly sprinkled around the cake, placed as the base, or used as a cake topper. Our absolute favorite beach wedding cake is 2 Adirondack chairs as the cake topper, with 2 pairs of flip flops beneath them. Figurines of the bride and groom sitting in the chairs is optional. A regular beach or lounge chair can also be used instead of the Adirondacks. One of our other favorites was a figurine bride and groom snoozing in a large hammock as the cake topper, with sand and miniature beer bottles beneath them. Not with real water, we promise! Picture this: the top cake layer made to look like an endless swimming pool. This can be done by cutting the top square edge off of the cake (like a router would carve out the edge of a wooden table), to simulate an endless pool. Figurines of the bride and groom's heads could be sticking out of the top of the pool, with shades and sunhats on, holding cocktails of course! How about leis as a cake topper? Or a hula bride figurine enticing the groom on the top of the cake? The cake could be wrapped with a sarong, or beach umbrella, Hawaiian cocktails, pineapples, or anything else Hawaiian could be incorporated. Just want to use beach themed colors? Stick with white, tan, off-white, teal, and of course, blue. The use of blue can be subtle as the color of the frosting, or air brushed onto the outside of the cake for a blended or accented look.